Bergerac is a town on the northern bank of the Dordogne River and in the western part of the Dordogne department: it is one of the largest, most important towns in the region. France This Way comment: Bergerac has several highlights including an extensive medieval centre and a frontage on the Dordogne river and a visit is highly recommended. 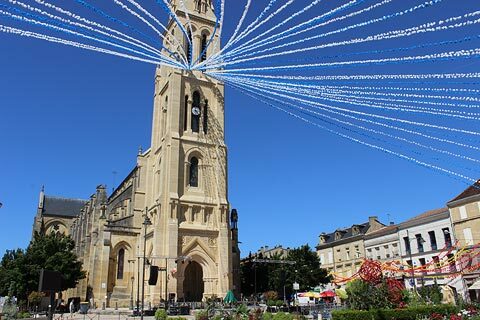 The first highlight of a trip to Bergerac is the chance to explore the old town - the area immediately north of the river - follow the signs to 'vieille ville' or just walk straight up from the main riverside car park. This part of the town has some lovely streets and squares to explore, and a good selection of boutiques. You will quickly reach the main square, Place Pelissiere that slopes gently upwards. At the top of this square is the lovely Saint Jacques Church which formed part of the Saint Jacques de Compostella pilgrimage. Much of it was destroyed in the Wars of Religion but its attractive bell-tower and balcony are original. 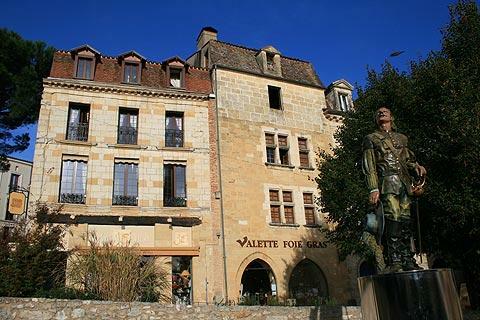 Next to the church is one of Bergerac’s statues of Cyrano de Bergerac… although much is made of the 'Cyrano connection' the reality is that there is almost no connection at all between the town and the famous character. This statue is also perhaps the most photographed monument in Bergerac and thers is often a queue of people wanting their photo take with the statue of Cyrano! At the lower end of Place Pelissiere is a fountain where locals once did their washing and all around the square there are cafes, old houses and small shops. It is a superb spot to stop and have lunch. At the top of the square take a look at the houses of Rue Saint James. These not only have some lovely shops but there is an excellent 14th century building and no 26 has some odd sculptures set into its walls. Wandering around the streets of Bergerac old town you will see lots of attractive, medieval, half-timbered buildings, there are some particularly good examples on La Rue Saint Clar many of which have the upper storey overhanging slightly the lower part of the building. There is another square nearby, the Place de la Mirpe, which has another of Cyrano de Bergerac’s statues and lots of trees making this a lovely shady spot in the height of summer. Take time to admire the buildings around the edge of the square, many of them are really lovely and this quiet square is our favourite in Bergerac. 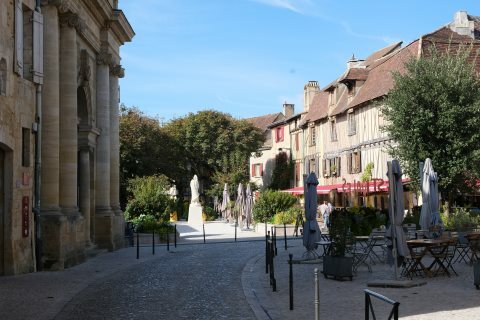 There are also several other restaurants scattered around in 'old-town' Bergerac among the attractive medieval half-timbered streets, and some open-air cafes where you can pass a pleasant hour or two people-watching. Below the old town, the quai is a lovely area on the banks of the Dordogne river next to an old bridge. Historically this was an important port although the only boats operating here now are the gabarres (traditional boats) that carry visitors for a trip along the river. The buildings around the port are lovely, and best seen by crossing the bridge and looking back to the town. You can follow a path along the river upstream to the new bridge, through a large grass area which is ideal for your picnic. If you have time a nicer way to take a stroll along the banks of the Dordogne River is to walk downstream from the quai area. The path continues along the river banks for several kilometres and into the countryside. 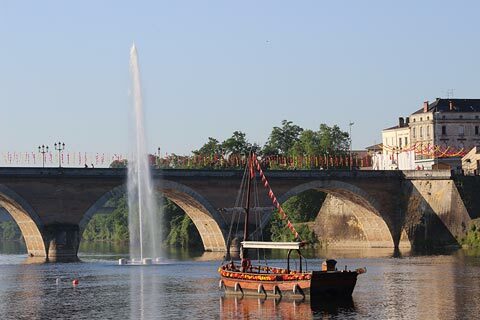 The first section is called the Promenade Pierre Loti and is extremely popular with Bergerac residents - and almost unknown to visitors! Continue north from the old town to reach the newer centre of Bergerac. Mostly dating from the 19th century this is also an attractive part of the town centred along the Rue de la Resistance and where you will find a larger range of shops. At the western end of this road is the main church in Bergerac and various narrow streets of shops and cafes. At the eastern end of Rue de la Resistance is a large square surrounded by imposing buildings (although the square tself is now largely a car park) and where you can find the Bergerac Tourist Office. The market, held in this part of Bergerac each Saturday, is one of the largest and most colourful markets in the Dordogne and is the best day to visit Bergerac. Close to the river front, the Recollets convent is a beautiful building built in 1630. It has a lovely inner courtyard surrounded by wooden galleries. In the summer it is a lovely spot sometimes used for concerts and near to Christmas there is a Christmas fair here. The convents des recollets is linked to the Maison des Vins de Bergerac (free entry) where there is an excellent exhibition of the 13 wine appellations of Bergerac. Wine tasting is available and there is an interactive display where you can amuse yourself identifying the various smells in a glass of wine. 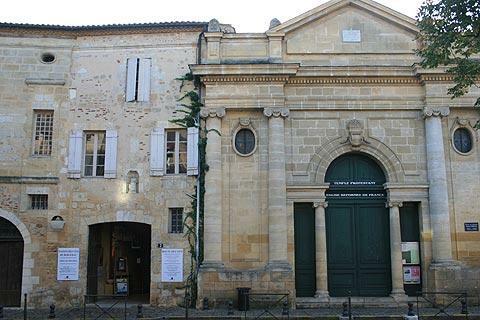 Also close by and not to be missed in Bergerac is the National Tobacco Museum. This is situated in the Maison Peyrarede which is one of Bergerac‘s most impressive buildings. It was built in 1604 and has one of those lovely corner turrets that you occasionally see on buildings in this area, and Renaissance mullion windows. Louis XIII spent a night in this privately owned hotel. The Tobacco museum includes an impressive display of pipes and retraces 3000 years of history. Tobacco is still an important crop in the region, and you will probably see the bright green broad leaves of the tobacco plant as you tour around. 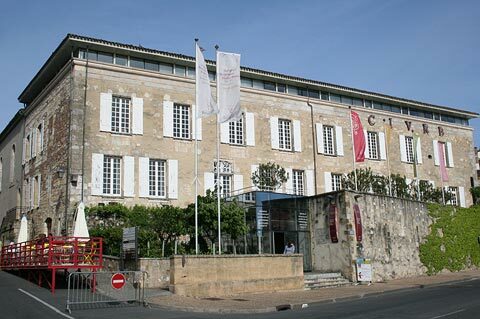 Another museum is the National Wine and River Navigation Museum, two activities which led to the wealth of Bergerac. 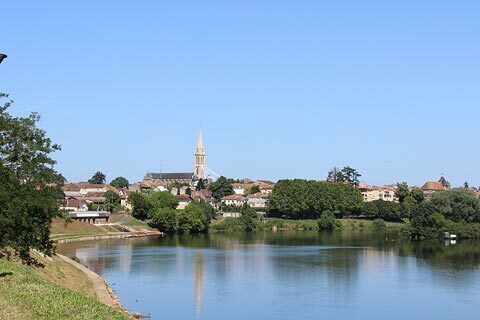 When you have explored Bergerac you can take an organised boat trip up the river to see the town and the nearby countryside from a different perspective. Note that several people we know have done this and said the boats didn't go far enough so if you have time I recommend you wait, and take a boat trip from one of the towns further upstream along the Dordogne River. About three kilometres north of the town centre on the edge of Bergerac there is a large area called Pombonne Park. Here you will find trees and nature trails as well as a lake with a small sandy beach. Pombonne is one of the Bergerac highlights where you will find lots of local people but very few tourists know about the lake and beach! Close to Bergerac there are several towns and villages that you will enjoy visiting, especially towards the south-east of the town. 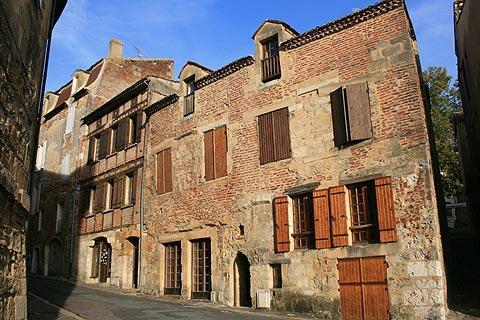 These include Eymet, the medieval village of Issigeac and the bastide towns of Monpazier (one of the 'most beautiful villages of France') and Villereal. Just south of the town you can sample the famous wines from the Chateau de Monbazillac. Further east (about one hour drive) you reach the 'famous' Dordogne destinations such as Domme, La Roque-Gageac and Sarlat as well as several famous castles: see the detailed Dordogne guide for details.